The vibrant atmosphere of Delhi markets can make shopping lots of fun. In fact, Delhi has the best markets in India, selling a huge array of items including handicrafts from all over the country. These top markets in Delhi are a treasure trove of goods waiting to be discovered. Looking for something specific? Delhi resident Ketaki has been helping people shop for the last 10 years and offers recommended bespoke Delhi shopping tours. This very popular and lively Delhi market, which was recently given a makeover, has something for everyone. You'll find goods from everywhere in India and Tibet here, and it's a great place to shop for things to take back home. However, you'll need all your bargaining skills to get a really decent price. Location: Janpath, just off Connaught Place, in New Delhi. What to Buy: Handicrafts, hippy clothing, shoes, paintings, brassware, Indian artifacts, leather work, and cheap jewelry. This huge Delhi market has been deliberately made to feel like a traditional weekly village market, called a haat. Small thatched roof cottages with a village atmosphere give it great ambiance. The market offers an exciting blend of handicrafts from all over India, food, and cultural and music performances. Don't miss it! Location: Opposite INA Market, south Delhi. Opening Hours: Daily from 10.30 a.m. to 10 p.m., including national holidays. What to Buy: Indian handcrafts and artifacts. Some of the best bargain shopping in Delhi can be found in the crumbling and chaotic Main Bazaar of the Paharganj traveler ghetto. Many of the shops in Paharganj also deal in wholesale and export to foreign countries, making it a good place to come and hunt out unique and inexpensive goods to import back home. Location: Paharganj Main Bazaar, opposite the New Delhi Railway Station. Opening Hours: Daily until around 9 p.m.
What to Buy: Clothes, shoes, jewelry, books, music, textiles, handicrafts, hookah pipes, incense. The shopping district of Chandni Chowk has been in existence for hundreds of years and an exploration of its winding, narrow alleyways is certainly an adventure. The lanes of Chandni Chowk are divided into bazaars with different areas of specialization. For fabrics, head to Katra Neel. In the Bhagirath Palace area, you'll find a huge range of electronics. Dariba Kalan is Old Delhi's ancient silver market full of silver jewelry. Kinari bazaar sells everything you need for a wedding, including saris. Khari Baoli Road has Asia's largest spice market. Food vendors in Chandni Chowk also serve up a delicious assortment of Delhi street food. Opening Hours: Daily except Sundays. What to Buy: Fabrics, jewelry, spices, and electronic goods. Sarojini Nagar is most famous for its really cheap designer clothes and reputable brands that have been rejected from export, either because of surplus quantity or small manufacturing defects. Shops and stalls, selling all kinds of clothes and fashion accessories, sprawl onto the streets. There's also a sweet market (Babu Market) and vegetable market (Subzi Mundi) in the area. Location: South Delhi, near Safdarjung Airport. Opening Hours: Daily except Mondays. What to Buy: Designer clothes, Indian clothes, fashion accessories, shoes. Established in 1951, Khan Market is a small U-shaped market that's one of Delhi's classiest. Bargain hunters are likely to be disappointed at this market. It's got a loyal following who go there to shop at its branded outlets. One of the best things about this market is its interesting book shops. It's also got some excellent tailors who will make you a suit in less than a week. For Ayurvedic food, medicine and skin care check out Biotique, and Khadi. Hidden away, you'll find some trendy cafes and lounges to relax in, many with balconies overlooking the street. Location: New Delhi, not far from India Gate. What to Buy: Books, music, branded and tailored clothes, Ayurvedic food and cosmetics, and home furnishings. 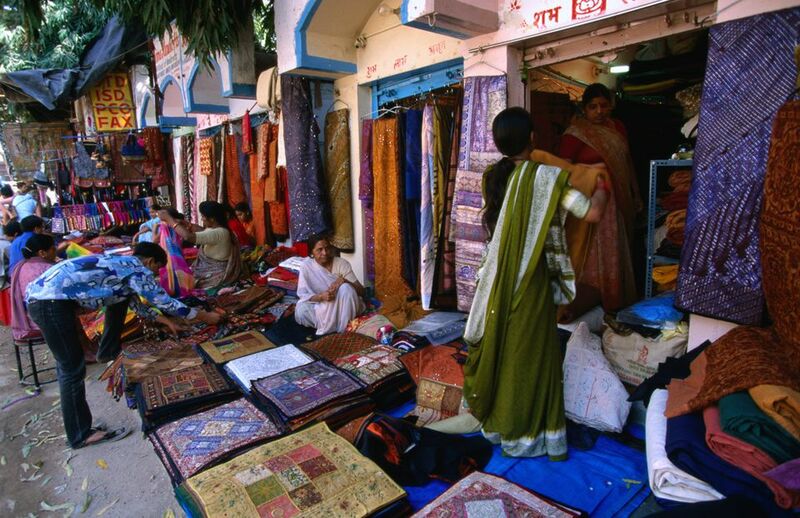 If you're looking to buy fabrics by the meter, Shankar Market is where you should head! It has more than 150 shops and stalls spread over two floors, stocking everything from plain cotton to silk brocades. There are all kinds of hand-loom textiles to drool over including ikat, block prints, and weaves from Odisha, Bengal, and Andhra Pradesh. The market's central Delhi location is handy too! Location: Opposite Connaught Place M-Block. Opening Hours: 11 a.m. until 8.30 p.m. Closed Sundays. This quaint market attracts quite a few rich Indian socialites because of its art and antique shops. It's a well-designed market in an upscale neighborhood. You'll also find some wonderful tea shops there. Try the Asia Tea House (formerly Asia Tea House) and Mittal Tea House. They're situated next to each other. Location: Off Mathura Road in New Delhi, not too far away from Connaught Place, near the zoo and Oberoi Hotel. What to Buy: Tea, silver jewelry, art, textiles, carpets, and antiques. Location: South Delhi, near Defense Colony (between Greater Kailash and South Extension). What to Buy: Indian clothing, shoes, bags, accessories (including Indian bangles), and home furnishings. Pottery from all over India is available at Matka Market in south Delhi. The market is a fantastic place to shop for festival decorations, especially during Diwali. The range of colorful clay diyas and pots is astonishing, with more than 100 different vendors. Other items commonly available at the market include blue Jaipuri pottery, terracotta Bankura horses, clay idols of Hindu gods and goddesses, garden pots and plant holders, vases, lanterns and earthen wind chimes. Location: A.K. Roy Marg, near Sarojini Nagar bus depot, south Delhi. Opening Hours: Daily from 10 a.m. until 8 p.m. (and later in the lead-up to Diwali). What to Buy: All kinds of clay items.